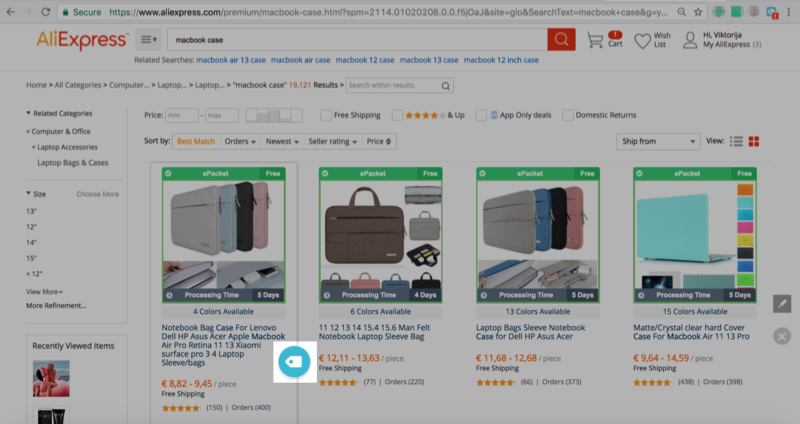 To be able to import products from the AliExpress.com website, you will need to install the Oberlo Chrome Extension. 1. Go to the AliExpress.com website. 2. Type in any keyword in the search tool or use the category filter on the left side to see product listings. 3. Move a mouse on the product to see the Oberlo icon next to it. The Oberlo icon also appears when you are on the specific product page. Take note, that the Oberlo icon doesn't appear on the supplier's store page, therefore, you will not be able to import products from it. 4. Click on it to add the product to the Import list. 5. Go to the Import List in Oberlo. 6. Customize products and click on the "Import to store" button to make the product appear in your Shopify store. How Can I Sort Products on AliExpress Using the OCE?